JNO, Evans and Son Printing Coy., 486-488 Kent Street Sydney, New South Wales 1938. A solid native timber Hawaiian traditional board, 5 ft– 12 ft and 13.5 inches to 20 inches wide. Common use; ridden prone, kneeling or standing. 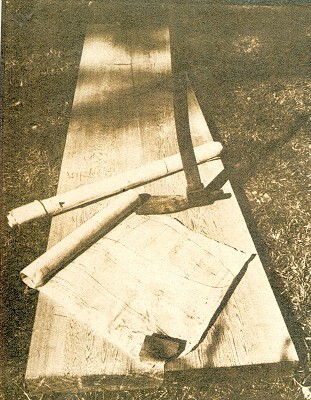 A solid timber board similar to 1 above, but made from imported timber (usually Californian redwood), due to theexploitation of the native forests, and thicker, to improve the strength of the coarser grained substitutes. The imported timber was lighter and the added thickness increased the floatation of these boards. The classic dimensions and template retained but use of waterproof glues developed in WWI facilitates construction from laminated blanks. The original application of the stringer, this reduced timber cost and weight with a mix of strong and light timbers, e.g. balsa and redwood. 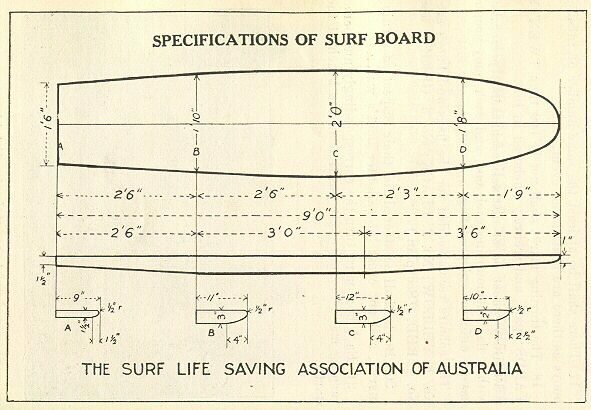 More sophisticated construction involved chambering or hollowing out timber sections before laminating together to reduce weight further, possibly influenced by Tom Blake’s Hollow plywood design.. Australian name ‘Church windows’ and mainland USA name ‘Gothic’ circa 1940-50, descriptive of the template.